Yes that's a small poetic glimpse of my home state, Kerala and my home town is famously known as ,"The Venice of the East","Alappuzha "(previously known as Alleppey) ,the name honored by one of the viceroy of the Indian empire of the early 20th century,Lord Curzon. Alappuzha , the name itself means an amalgamation of the sea and a network of rivers. And so my town is quite popular for its spectacular backwaters with its pride ride , the humble yet magnificent houseboats, simplicity at its best -the lifestyle, the residents and their attitudes thereby. A must to see , enjoy & cherish forever activity/destination for any die hard traveler and you'll know why this southern part of India is proudly called ,"God's own country". 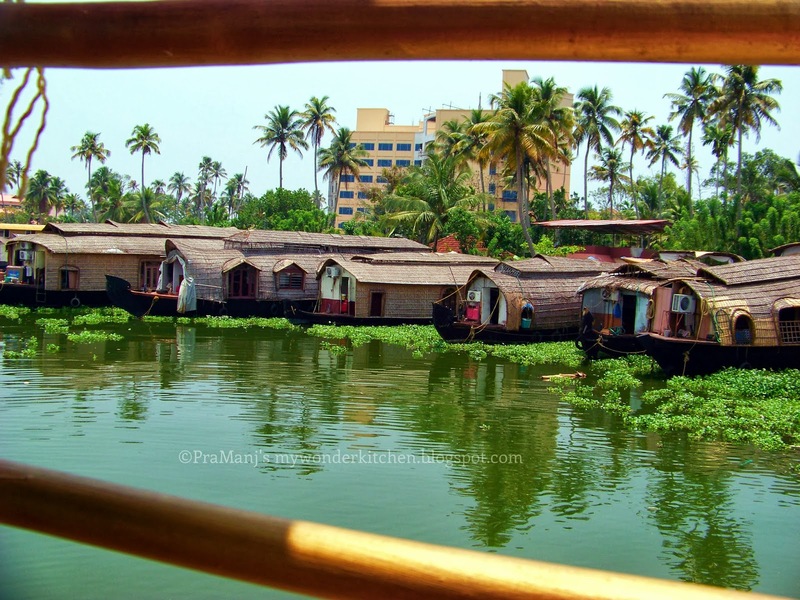 Last year I got a golden chance to enjoy the p"RIDE" of Alappuzha backwaters, the houseboats .Here is a sneak peek through my eyes (or my camera's eyes) just for YOU. Do you know what's the speciality food served in these riding abodes? 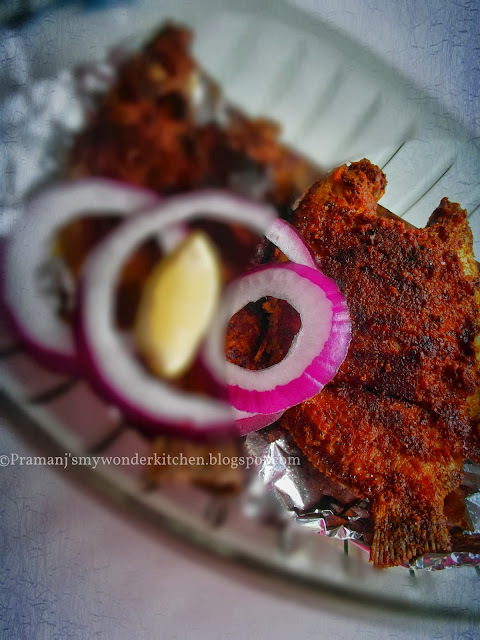 Varieties of sea foods plus other Kerala favorite lip smacking menu. One such tantalizing special sea food item is hot "Karimeen Porichathu/Pearl spot fish fry" with boiled plain rice and other tasty curries and side dish.The specialty about this fish is not only that they are found abundantly here in Alappuzha ,but also that they are freshly caught and freshly made for you on the spot. How yummy is that? Are you drooling? ...well, I don't know about you but I am .It's my favorite and I betcha every proud Keralite's too :). A quite sought after delicacy of Kerala. 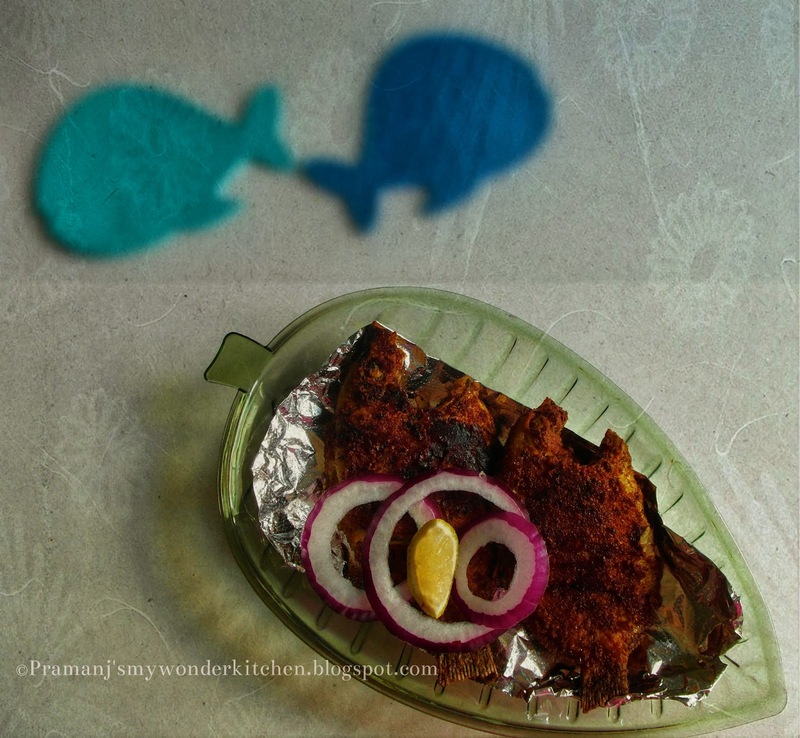 Here's a snap of the celebrity sea food of God's own country ,"Karimeen aka Pearl spot ". Something FISHy here-is that a French kiss session going on here ;O))..damn there's a villain 2..playing gooseberry huh ?..Love is tough indeed!! Unfortunately, here in the US I have never ever got the fresh Pearl spots, so I end up using the frozen ones from the Kerala store. They taste not that close to what we get back in Kerala. 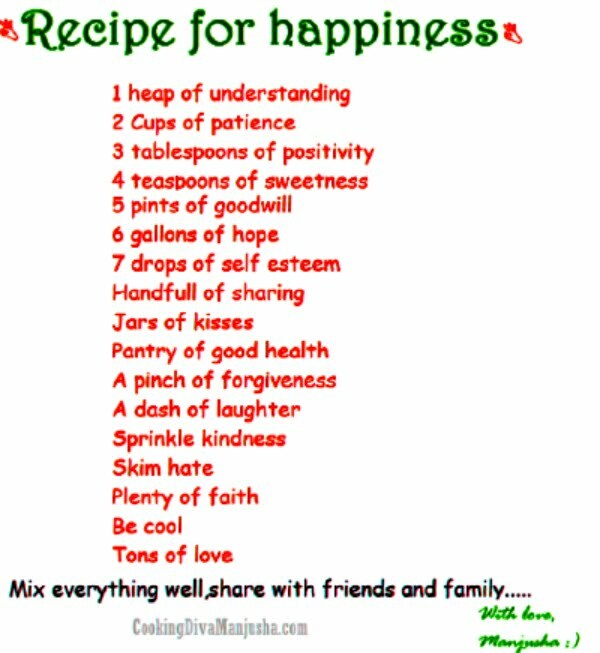 Nevertheless, Thank God at least,"Something is better than nothing" ; P. Hard to get but easy & tasty to make & eat. 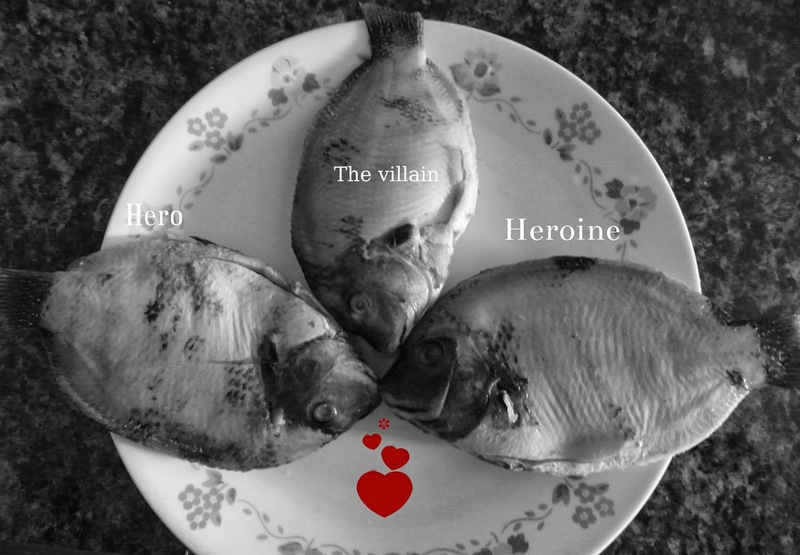 Karimeen cleaned and slit-2 nos. Clean the fish properly , make 4-5 slits on both the sides and smear the lemon juice all over them and keep it aside. Meantime,grind the shallot,ginger-garlic paste,salt,water and all the powders into a fine thick paste. Apply this paste on the slit fish on both the sides and keep it aside /refrigerate it(15-30 minutes). After 3o minutes or so, heat a pan with enough coconut oil to fry the fish. Deep fry both sides of the fish until they get golden in color on medium heat . 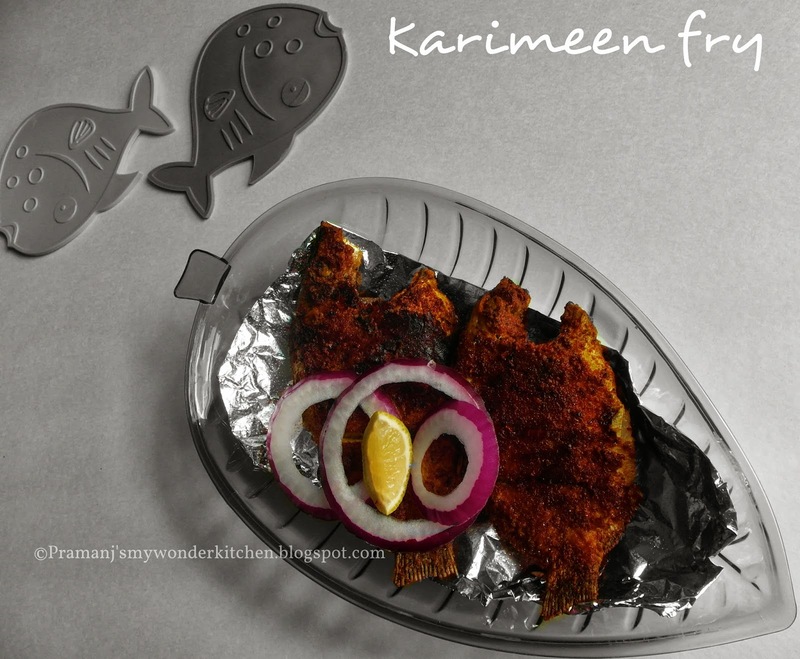 Karimeen is ready to be served with hot rice and curry and side dish if any.